I saw this story on the news a couple nights ago. 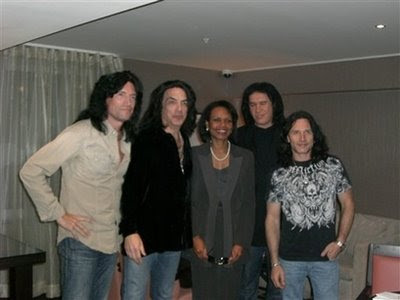 Apparently when Gene Simmons discovered Condi was staying in the same European hotel, he requested an opportunity for the members of Kiss to meet with her. I hear members of Condi's ontourage received gifts of Kiss T-shirts too. Gene Simmons is one of the odder ducks of music, an outspoken Republican in a profession famous for extremely liberal points of view. He's also has a very lucative side business promoting Indy Racing.